The Hurdle Collection has crisscrossed the globe, finding its way in everything from stunning casual cafes to modern co-working spaces. This playfully minimal collection lends a sophisticated informality, punching up almost any design. It has an uncanny ability to stand out and blend in all at the same time. And now, Hurdle can be yours. 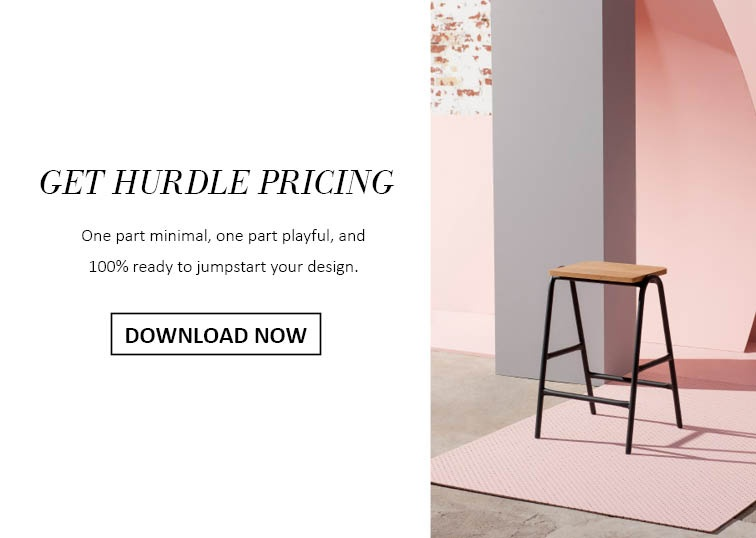 Through an exclusive partnership with the collection’s designers, Dowel Jones, the entire Hurdle line is available to order. Fall in love with these great restaurant chairs - take a look at our top five favorite designs using the Hurdle Collection. Featuring a calming blend of textured neutrals, The Rabbit Hole in Australia is the organic tea bar of your dreams. Warming up the stark space, creamy and dreamy White Oak takes center stage with appearances on the Hurdle seats and table bases. It’s no coincidence The Rabbit Hole’s design is cleansing and refreshing, just as your favorite tea should be. 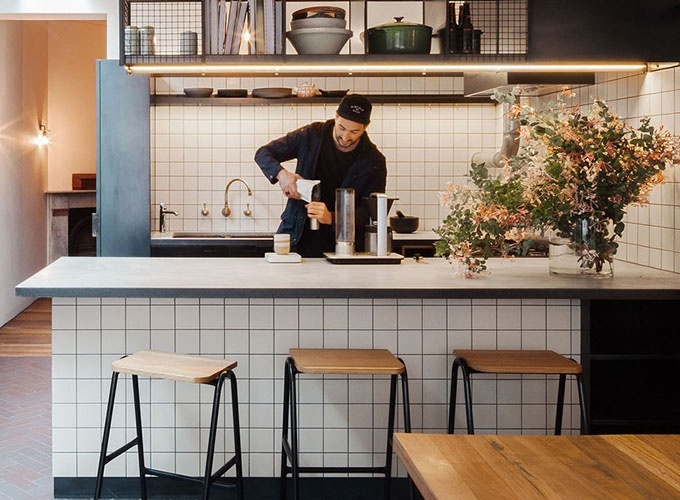 With a design that feels one part lodge and one part urban cafe, Sunny’s Pizza serves up a surprisingly charming and pleasant design. 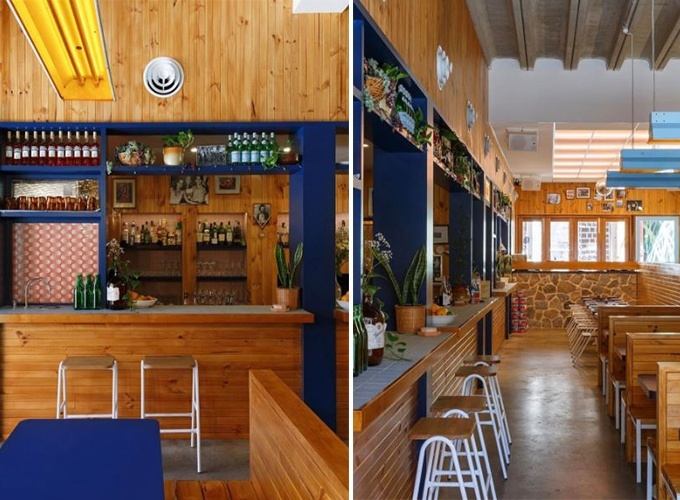 With the help of bright cobalt blue, sleek Hurdle Barstools, and neon signs, Sunny’s has just the right amount of modern touches to balance all of that wood paneling. One look inside and you’ll understand its namesake. 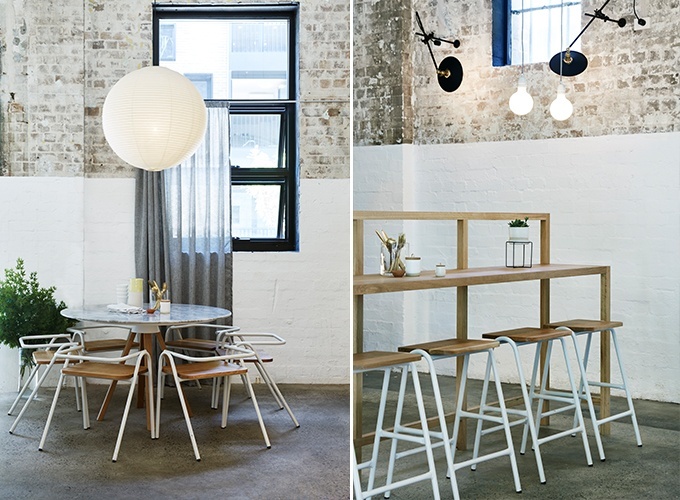 The Hurdle Collection feels perfectly at home in Prospect Coffee Roasters. Finished in a dark navy—a perfect match to the coffee cups and saucers—the Half Hurdle Chair and Barstool adds a lovely contrast to the white stone floors and natural wood table tops. If only all offices and co-working spaces looked like this. Until we get the office of our dreams, we have Flux to look at. 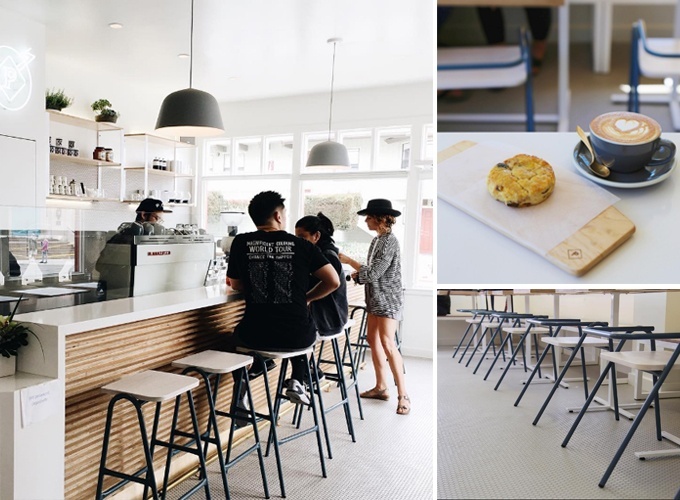 Perched on each side of a simple bar height table, blue Hurdle Barstools a pop of color and whimsy to the modern cafeteria. 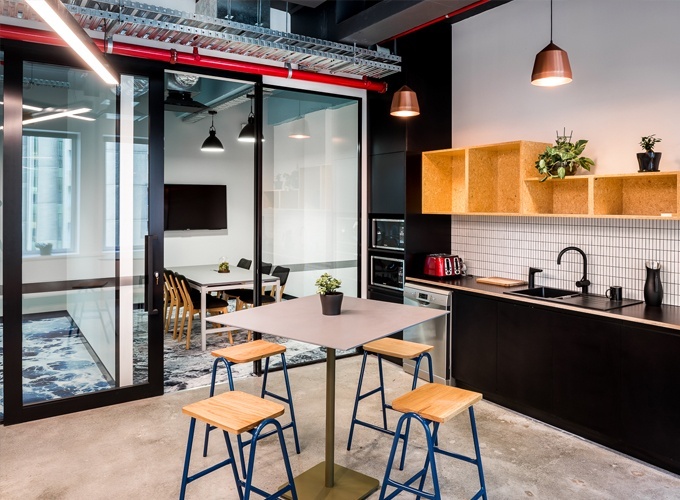 It's the perfect place for a quick bite and some water cooler talk. And finally, our last Hurdle installation takes us to an old car factory. Spanning 13,000 feet, Welcome to Thornbury is now a permanent bar and food truck stop. But don't let the "food truck stop" label fool you - Welcome to Thornbury does not lack in terms of design. This expansive spaces is fitted with multiple seating areas and food options galore. 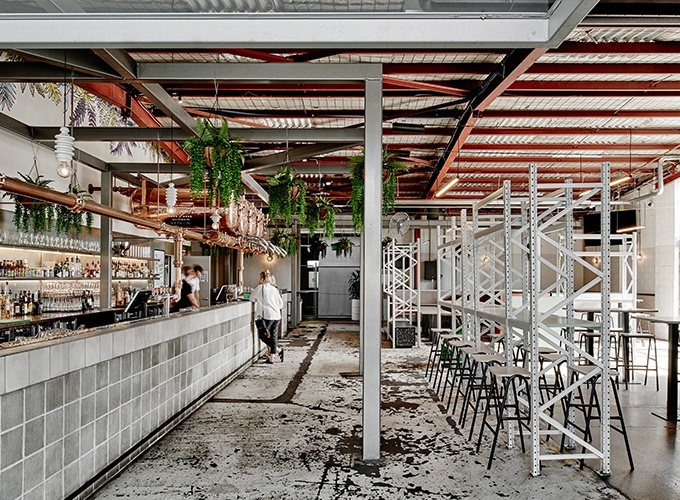 Design-oriented food courts are on the rise, and Welcome to Thornbury boasts a modern and cool aesthetic. Our favorite design element can be found in the indoor dining space. Tucked under an industrial steel bar, you’ll find the Hurdle Barstools finished in sleek black. The Hurdle Collection is comprised of four pieces: a chair, a dining stool, and two barstools. Hurdle is available to order. View pricing or contact our sales team today.